I decided to draw this portrait in a landscape format rather than the usual portrait format. The reference photo was a closeup of the cat’s head, so working the paper on its broad side allowed me to keep the focus on the cats character. After finishing the work in ink pen, I began applying the watercolors. In doing so, I tried to bring out some of this cat’s unique and rather strong red markings in the face, as well as capturing the overall coloration. People say that the eyes are the windows to the soul. This is even more true in portrait painting, and to get the eyes right, I had to correct some mis-coloration made by the camera’s flash, as well as putting in some highlights that make the eyes “gleam” and come more alive. 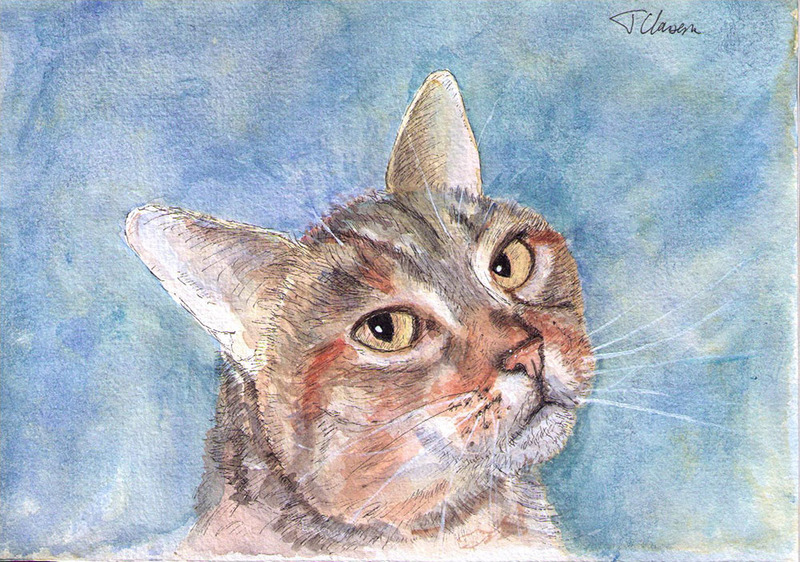 Tagged Ballpoint pen, brindle tabby, Cat, commission, Drawing, Featured, painting, tabby, WatercolorBookmark the permalink. Beautifully done! I definitely looked at the eyes first. Oh My Gosh! This is beautiful! The colours are awesome. Cuzz looks wonderful. Good job!